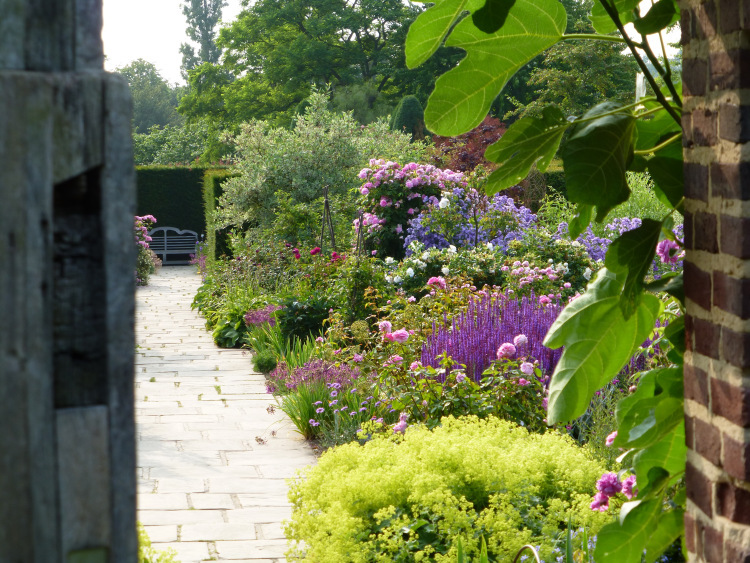 Walking into the Rose Garden at Sissinghurst in June can feel like walking into another world. The scent, colour and sheer variety of roses and flowers is a visual feast for the eyes with everything competing for our attention at once. Quite naturally our eye is drawn to those roses that are big, blousy and loud. It’s hard to ignore ‘Variegata di Bologna’, ‘Paul Ricault’ or ‘Fantin Latour’ when their sheer size and extravagance creates such a commanding presence in the garden, compelling us to admire them. 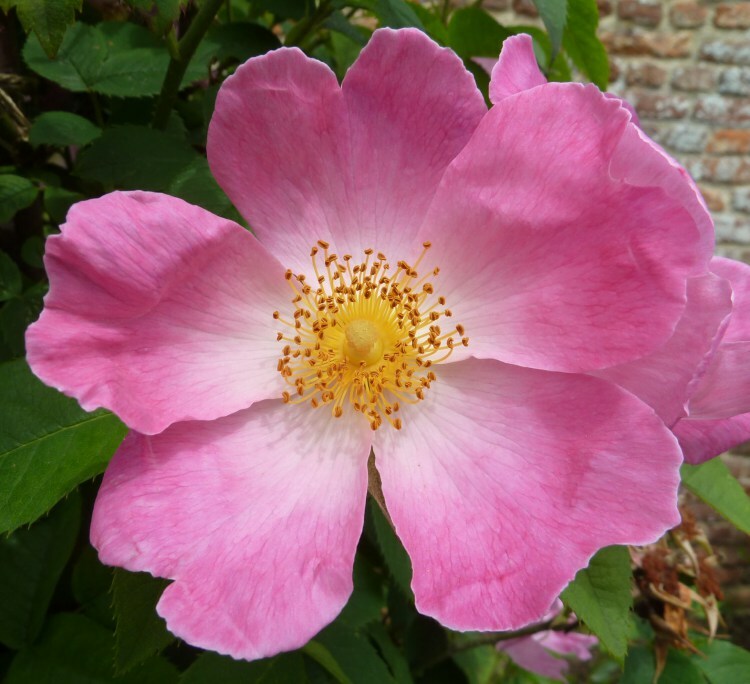 I must confess that when I first started working at Sissinghurst I was completely captivated by all the wonderful double roses bombarding me and it took me a while to learn to appreciate the quieter members of the Rose Garden. At first, I barely gave the single roses a second glance, but gradually my appreciation of them has grown. I began to notice the luminosity that single roses often have, the golden stamen and simple flowers that really capture everything that is beautiful about a rose. Many of them are species roses and it’s true that nature needs no interference from us to produce the best combination of flower and foliage, with simple and charming roses nestling amongst the leaves. Others are natural hybrids and a few have been bred by Rosarians who understand that single roses have a beauty all of their own. But which ones are worthy of a mention? 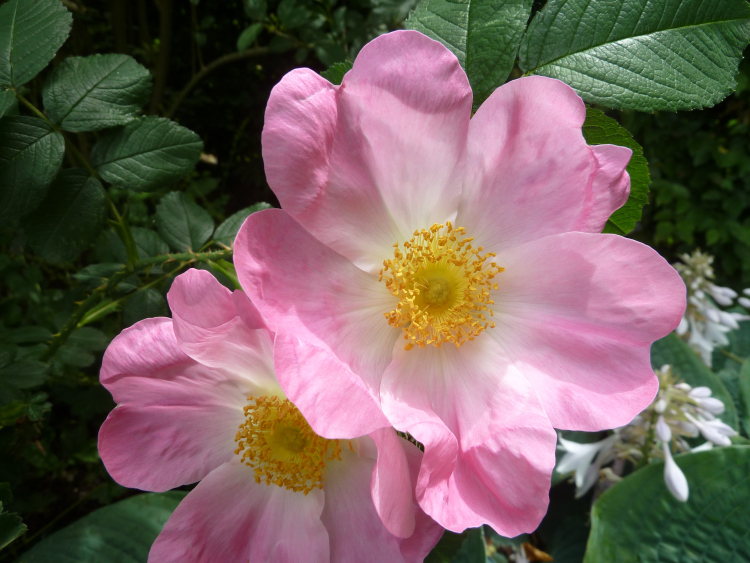 Infact, there are many pink single roses worthy of a mention including Rosa ‘Anemonoides’, Rosa x polliniana, Rosa glauca, Rosa villosa and Rosa eglanteria. All beautiful and garden worthy. Yellow singles include Rosa ‘Cantabrigiensis’ found in 1931 as a seedling in the Cambridge Botanic Garden and grown here in the Cottage Garden. It is a gentle yellow; soft and pale that sits well in the shady area under the parrotia tree. ‘Golden Wings’ bred in the US in the 1950s is also a good yellow; bright but not garish with dark golden stamen. For white roses there is ‘Nevada’, a creamy white that looks good in the White Garden and for those who like apricot/peach-pinks there is no better choice than the hybrid teas ‘Mrs Oakley Fisher’ or ‘Ellen Willmott’. For a red rose choose Rosa moyesii ‘Geranium’ and for a lilac single choose ‘Lilac Charm’. There is certainly no shortage of good ones to choose from. A good Rose Garden consists of many elements, each with its own part to play in creating that feeling of drama, excitement and completeness. Single roses can serve to enhance our appreciation of the magnificent doubles that abound, as well as represent the other end of the rose spectrum. But they have their own special beauty too which is as great as the doubles any day.